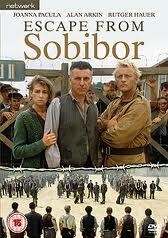 Brief Synopsis – Jewish prisoners in the Sobibor Death Camp during WWII attempt a mass escape before the Nazi guards kill them all. My Take on it – I remember seeing this on TV when it came out in April 1987 and to this day, it still lingers in my mind as such a powerful and uplifting story that many people don’t know even happened. When dealing with such a bleak and depressing subject, this story shows how even a small group of prisoners found a way to regain their humanity and individualism by choosing to fight back and subsequently letting more than half of the 600 prisoners find refuge in the forests of Poland. Unfortunately, many of them weren’t able to stay alive thru the end of WWII but even for those days, weeks or months that they remained alive, they once again had regained their own freedom and were no longer subjugated to the terrorizing methods of their Nazi guards. Alan Arkin and Rutger Hauer lead a cast of mostly unknowns and both were nominated for a Golden Globe with Hauer winning. Bottom Line – Excellent uplifting story of the largest escape from a Nazi death camp during WWII. Expertly done. Great performances. Highly Recommended! !